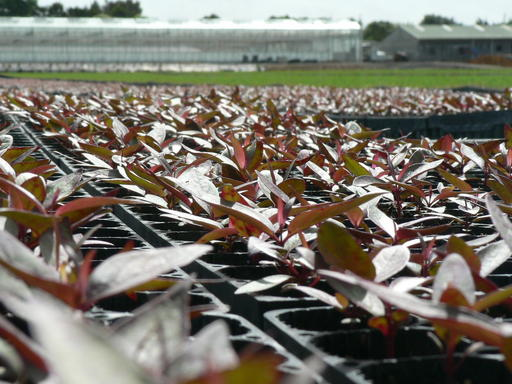 Recently we have been focussing on growing next year’s crop of alternative species. Although half a million is not a large quantity in forestry circles it makes an interesting change from much bigger numbers of Radiata pine. This year we are sowing Eucalyptus fastigata and Eucalyptus nitens, Acacia melanoxylon, Sequoia sempervirens, Phormium tenax (NZ Flax), Douglas fir, and Manuka. The variability of germination, seed size and foreign material included with the seed makes it very hard to mechanise the planting. Therefore all of the above species get propagated in a flat tray. Once germination has taken place we transplant an individual seedling into a cell that it will stay in for its cycle in the nursery. This all makes for a time-consuming process but it allows for a uniform crop, which has the best chance of meeting the required specification at the time of dispatch. The Radiata is now looking great with the nets being removed that have protected the crop from any potential bird attack. It’s now time to get on with fertilising and pest management to get them to specification for all those that require treestocks for early planting in 2016.